Scorpion is the warfighter's answer to precision attack using a small, lethal warhead against targets in areas requiring low collateral damage. 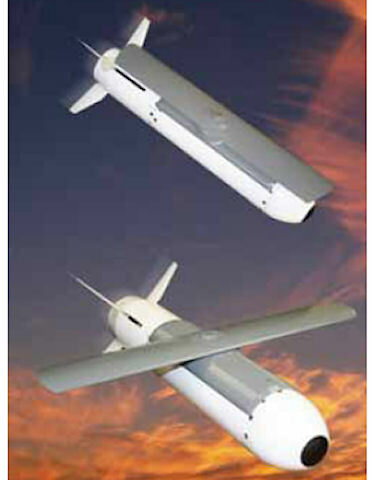 Scorpion is a lightweight, compact munition that provides the warfighter with low cost lethality against a broad target set. 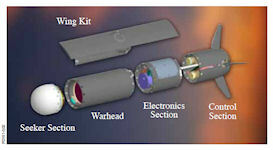 Scorpion is adaptable to multiple launch platforms, including manned or unmanned systems. Targets include structures, personnel, lightly armored vehicles, trucks, cars, missile launchers, and artillery or gun positions. Scorpion has a range of over 10 nautical miles, weighs less than 35 pounds, is 21.5 inches in length, and 4.25 inches in diameter. Scorpion can be deployed from various tube launch systems currently in use or from the M-299/M-310 launch system used to launch Hellfire missiles from helicopters and Predator UAVs. When used with the M-299/M-310, Scorpion slides onto the rail and communicates with the launch platform in exactly the same way as the Hellfire. Three Scorpion weapons can be deployed on a single rail used for one Hellfire. When used from a tube launcher, up to two Scorpion weapons can be launched from a single tube to enhance the loadout of the launch platform. 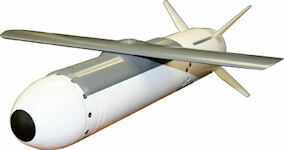 Scorpion uses a semi-active laser (SAL) seeker for man-in-the-loop terminal guidance, and can be tailored to use planned, imaging infrared (I2R), shortwave infrared (SWIR), or millimeter wave (MMW) seekers. 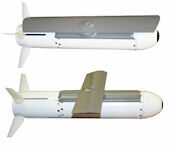 The precision provided by these seeker types ensures accuracy to less than one meter and dramatically reduces the possibility of collateral damage from the BattleAxe warhead. Reactive material weapon systems can be game-changers for the warfighter. The new BattleAxe warhead was developed by Alliant Techsystems, or ATK, for the Air Force. The objective of this 2004 prototype project was to increase energy output at the warhead target and therebymaintain lethality in a smaller warhead size. This will be accomplished through the design and demonstration of a Reactive Material Battle Axe Warhead via modeling and design, warhead fabrication,test planning and support and analysis. Scorpion is the first weapon to use reactive material (RM) fragments, replacing the metal shrapnel in other warheads. BattleAxe is the same size as existing warheads on the Hellfire missile, which is used to take out tanks, buildings and "softer targets." BattleAxe combines all three functions into a single package. And its RM shrapnel will make it even more formidable. BattleAxe's reactive fragments are specifically intended to improve its performance against soft targets such as trucks. The fragments ignite on impact, releasing their energy inside the target. This gives a corresponding increase in the chance of causing catastrophic damage. And while the destructive power of reactive fragments might be likened to a cluster bomb, there is no danger afterwards. Unlikely dud bomblets, there is no risk of fragments exploding. The vision of the Reactive Material Structures (RMS) program is to develop materials that can serve as high-strength structural materials, and can also be controllably stimulated to produce blast energy on demand. Reactive materials are solid materials such as metals and/or metal oxides that are not detonable, but are capable of releasing large amounts of enthalpic energy very rapidly. These materials can provide energy that exceed those of traditional explosives, and offer the potential of significantly increasing performance without increasing size or weight. The potential of this class of materials has not been realized because of limitations related to dynamic control of strength and energy conversion mechanisms. The DARPA program sought to develop and demonstrate the revolutionary capability of integrating reactive and structural materials into a single material system, with a mechanism to activate the system and release energy upon command.